Whether you are planning a Kitchen Remodel or Bathroom Renovation, and everything in between, all remodeling projects start with a vision. Maybe that vision is sketched on a napkin or tucked away in your dreams, but visualization is often the most challenging aspect of executing your remodel. Proper design and planning is the key to success when beginning a remodeling project and we use state of the art (3-D Designs and Planning) software to bring that vision to reality with realistic and accurate renderings. The 3-D remodeling design process begins with detailed measurements of the existing space and layout of your home and property so we can recreate the space in a 3-D designs model. We then ask you to provide us with the details of your vision, from layout ideas to color choices to cabinet styles and everything in between. We combine the detailed measurements with your wants and needs and factor in your budget to provide realistic models of the proposed design. Every step of the way you will see the project evolve from a dream to a reality, and your input is the single most important aspect of the process. The design is completed in three phases, starting with an overhead 2-D design to show the layout of the space. This helps visualize and identify any potential design flaws with the layout and flow of the design. Creating a layout that offers proper flow and doesn’t crowd the space is crucial. That large shower or kitchen island may not fit the design and its intended use so space planning is critical. 2-D drawings will show everything including; walls, cabinetry, stairs, furniture, fixtures, and dimensions to bring that design concept to life. Once a 2-D design is completed we begin the process of modeling your project in a 3-D designs setting. The initial 3-D drawings will show you how it will look to live and entertain in your new space. This is where the remodeling project takes life with true materials and textures, from counter tops to stone walls to molding details and everything floor to ceiling you will see the space in its final form. We offer the ability to add thousands of products from different manufacturers and endless 3-D models for everything in-between. Whether a simple design or creative elements design, we enjoy the challenge of producing a design that will mimic the end product. Finally once all the 2-D and 3-D designs are approved and all revisions made we begin building the detailed construction plans that are ready for Permits and the Construction phase. 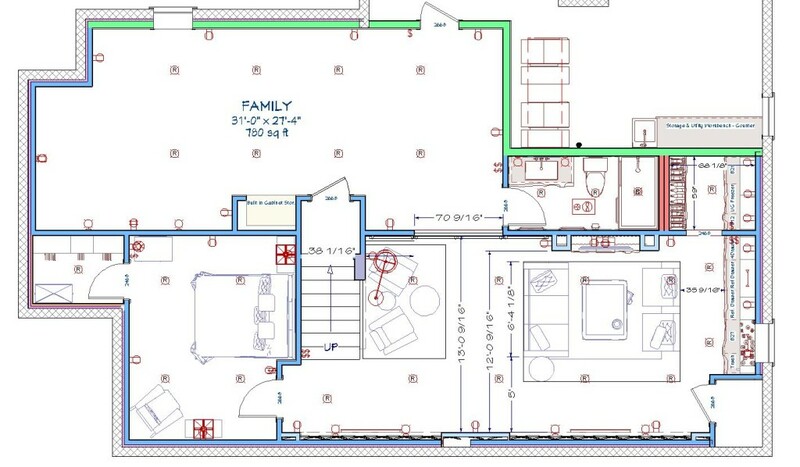 The final drawings include the 2-D layouts, 3-D Designs Layouts, Cross Section views, Elevation views, material schedules, Electrical and Plumbing layouts, cabinets, windows, doors, and everything we need to begin your project.